BBC Sport pundit Garth Crooks is back with his team of the week, and as expected, it hasn’t passed without some criticism from readers. Crooks has made his selections across the Premier League and League Cup final, with Raheem Sterling getting the nod after an impressive performance as well as scoring the decisive penalty in the shoot-out with Chelsea. Unsurprisingly, Kepa Arrizabalaga doesn’t feature after he caused controversy at Wembley in extra-time, although judging from some of the comments below, many were left questioning the decision from Crooks to select Liverpool goalkeeper Alisson between the posts. 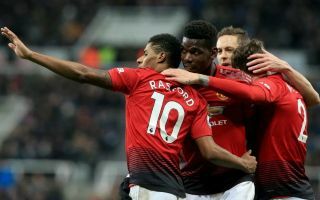 The Brazilian shot-stopper did make one decisive intervention in the second half at Old Trafford, but similarly with Paul Pogba also being selected in the team of the week, many were convinced that the pair didn’t do enough to warrant a place in the XI. Elsewhere, few would have argued against either Gerard Deulofeu or Wilfried Zaha getting the nod as both were instrumental in wins for Watford and Crystal Palace respectively, while Victor Lindelof is also picked after another impressive display in the heart of the United defence. Nevertheless, Crooks has done well to spread his selections across the league to avoid being criticised for ‘big team’ bias, with the likes of Issa Diop, James Tarkowski and Nathan Ake forming the backline, while Luka Milivojevic and Ashley Barnes complete the line-up. It wouldn’t be a Crooks team of the week without plenty of criticism though, but ultimately it comes down to personal opinion on who deserves to be included and who should have been snubbed. With that in mind, he’s never going to please everybody. Crooks’ team of the week: Alisson; Diop, Tarkowski, Lindelof, Ake; Deulofeu, Pogba, Milivojevic, Sterling; Barnes, Zaha (via BBC Sport). Haha! Alisson for one save, yet the games MOTM (Shaw) doesn’t even get a look in? He must have watched a different Pogba . What are you smoking Garth?? Pogba ? did he even watch the same game? Liverpool dominated midfield.